Faced with the prospect of these properties and histories being lost, sisters Mabel, Elsie and Etta Wilcox worked hard to preserve them for future generations. Miss Mabel, the last to survive of the three, guided their legacy to be carried on by Waioli Corporation. Waioli Corporation celebrates and shares the rich diverse multicultural history of Kauai by authentically preserving numerous historic sites and collections around the island. Made available to be enjoyed by the local community and visitors through guided tours and educational research are the Waioli Mission House and Mahamoku museums in Hanalei, the Grove Farm museum in Lihue, and in their original roundhouse in Puhi, the largest collection of operating Kauai sugar plantation steam locomotives. The three museum sites and four plantation steam locomotives are listed on the State and National Registers of Historic Places. Also protected by Waioli Corporation are the still farmed ancient pre-contact taro fields and auwae systems of the Waioli Valley, and the pristine Lepeuli ahupua’a, which conserves reef, sea, avian, flora and historical collections in their unaltered native habitat. 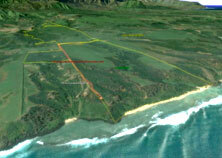 In addition, Waioli Corporation has provided for the community, parks at Hanalei and Poipu, as well as easements and beach access at various locations under its protection. Preserved by Misses Elsie and Mabel Wilcox throughout their lifetimes, in 1975 these historic sites and extensive unique collections were entrusted to Waioli Corporation, a 501(c)(3) non-profit organization whose Board of Trustees is made up of community members. Community and visitor participation and financial support are essential to continue their legacy. Mr. Lindsay A. Faye, Jr. In Hanalei, the 1836 Waioli Mission House built by the Reverend W.P. Alexander, was home for missionary teachers Abner and Lucy Wilcox and their seven sons. For 50 years after Abner and Lucy’s deaths in 1869, the old mission home sat empty until it was restored in 1921 by their granddaughters Etta, Elsie and Mabel Wilcox. 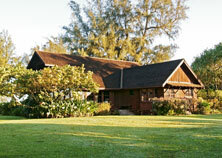 The mission house today continues as a quiet touchstone to the missionary efforts on Kauai, with guided tours offered on Tuesdays, Thursdays and Saturdays from 9:00 a.m. to 3:00 p.m.
Mahamoku, a second museum in Hanalei, was built in 1914 and is the last surviving twentieth century intact beach house along Hanalei Bay. Tours of the house are available to the public, school groups, and other special groups. In addition to visitors learning from and enjoying the historic interiors, Mahamoku serves as an exhibit pavilion for special educational exhibits from the extensive collections of Waioli Mission House and Grove Farm. It also provides a unique extended museum experience that gives visitors personal knowledge of the pace and lifestyle of that bygone era. Mahamoku is the one true reflection of the aesthetic and personality of Mabel Wilcox and typical of beach architecture of that time. She once said that had she not become a nurse, she would have become an architect. Mahamoku, its caretaker’s quarters, and its landscape survive as one of Miss Mabel’s most noteworthy endeavors and have been preserved as she designed and furnished them nearly one hundred years ago. 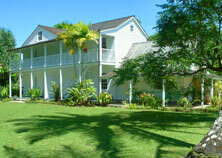 Lepeuli was purchased from Kamehameha III by Abner Wilcox in 1852 to be used as a family farm, and has continued to be preserved in agricultural operations since that time. This intact ahupua’a contains the most pristine coral reef in Hawaii providing a rich, healthy and protected habitat for native and endangered flora, sea and bird life, which includes providing for and protecting nesting sites for the Laysan Albatross, as well as already existing nesting sea turtles, and resting monk seals.